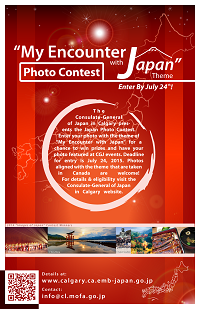 The Consulate-General of Japan in Calgary is pleased to announce its second Japan Photo Contest. We are currently open for submission of photographs in line with this year’s theme of “My Encounter with Japan”. Enter to win prizes and a chance to have your photograph displayed at Consulate-General of Japan in Calgary events. Photos do not need to be taken in Japan. In fact, the photo can have been taken anywhere in the world – Japan, Canada or otherwise – as long as it coincides with the designated theme. The deadline for submission to the Consulate-General of Japan in Calgary is JULY 24th, 2015 (only one submission per person). Please download the conditions form for all other specific conditions and submission details.